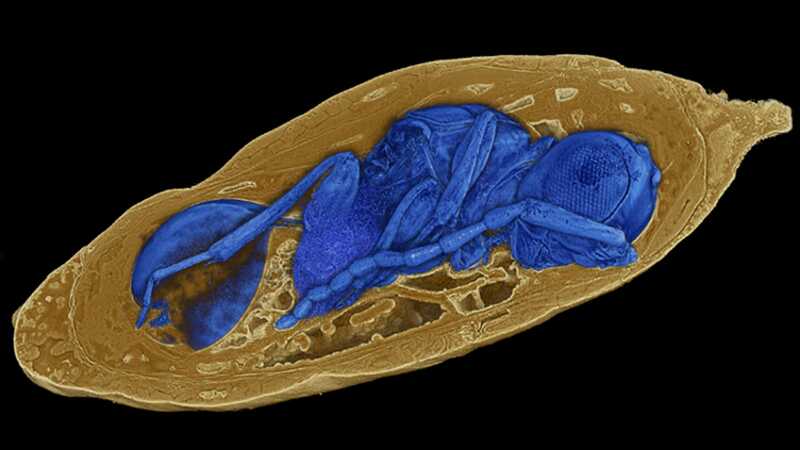 X-ray shows a hidden parasitic wasp in mineralized or fossilized fly dummies. This particular specimen is about 30-40 million years old. Careful study of over 1,500 fly-doll fossils has led to the discovery of four new species of ancient parasitic wasps dating back between 66 million and 23 million years (19659004) The study published today in Nature Communications provides the first definitive proof of parasitic behavior among wasps, more specifically, the first definitive evidence of endoparasitism under wasps, in which the parasite (like a wasp or tapeworm) develops or lives in his host. A team led by Thomas van de Kamp of the Karlsruhe Institute of Technology (KIT) used a new, powerful scanning technique to look at the remnants of 1,510 mineralized fly dummies, triggering 55 parasitic events. In addition, the researchers were able to identify four previously unknown species of parasitic wasps and even study new specimens even though they are trapped in the mineralized fly pupae. A small sample of the 1510 fossilized fly dummies used in the study. It is difficult to find examples of parasitic behavior in the fossil record because it requires the parasite to be caught in the parasitization of its host. In addition, many parasites develop within their hosts (as here) and are not visible on the outside of the fossil. So far, the fossil record of parasitic wasps has been confined to isolated adults trapped in amber. In this case, the researchers managed to discover fully developed wasps in their flies hosts, using a technique called high-throughput synchrotron x-ray microtomography. "We used a synchrotron – a kind of particle accelerator – to take intensive X-rays to perform high-throughput tomography [cross-sections of solid bodies] of 1,510 samples in one week," van de Kamp told Gizmodo. "The study was conducted by a highly interdisciplinary team of biologists, paleontologists, physicists, computer scientists and mathematicians using a sophisticated experimental set-up developed and operated by physicists and computer scientists, image analysis algorithms developed and optimized by mathematicians, and trusted in the expertise of paleontologists and entomologists to interpret our findings, it was an amazing experience to work together and inspire scientists from different disciplines throughout the duration of the project. " An X-ray projection of a fossil parasite in which the wasp clearly visible in the fly puppets. The fossils of the fly dolls come from the Natural History Museum Basel and the Swedish Museum of Natural History. The fly-dummies and their parasitic content date back to the Paleogene period, which began at the end of the Cretaceous period (after the extinction of the dinosaurs). The fossils from this collection were not dated by van der Kamp's team, but on previous studies on fossils found in the same region in France. Of the 1,510 scanned samples, there were 55 parasitic events, or about 3.6 percent fossils. In almost all cases wasps were completely developed and located at the point of departure. The fact that more premature wasps were not found suggests that earlier stages, such as eggs or larvae, were probably not fossilized because of their softer exoskeleton. All wasps described in the new study evolved into solitary parasite fly dummies inside. Her life cycle began with a female wasp, which put an egg in a fly doll. After hatching, the wasp larva fed on the surviving fly dummies and eventually led to death. Once fully developed, the wasp emerged from its incubator, looking for a mating partner. After mating, the female wasps searched for a fly doll and restarted the cycle. A video showing the hidden parasitoid wasp in a fossilized fly doll. Four new species of parasitic wasps were discovered, all of which are now endowed with the coolest names: Xenomorphia resurrecta Xenomorphia handschini Koptera anka and Palaeortona quercyensis . "The detail of the conservation of many wasps was simply extraordinary," said van der Kamp. "The 3D reconstructions of the tomographic data facilitated the description of species as they were done for existing [living] species and we were also amazed at how little is known about the way of life of existing parasitic wasps, despite the great biodiversity." Each species had unique physical adaptations to exploit their hosts. Two of the species, X. resurrecta and X. Handschini are very similar, which is why they were placed in the same genus or family of parasitic wasps. The main difference between these two types had to do with the shape of their waist. Video showing how the tomographic data was used to reconstruct the insect, in this case a female Xenomorphia resurrecta. "The other two species, Coptera anka and Palaeortona quercyensis differ from the Xenomorphia species by a series of exoskeletal extensions that serve as protection for hinge points "said van der Kamp. "This may point to a more liveable lifestyle, with its" horns "and beak-like lower jaws " Coptera anka certainly the strangest-looking species described in the study. " An important insight From this study is that old fossil collections like those used in this study now deserve a second look. By using state-of-the-art imaging techniques, scientists can now gain completely new insights from "forgotten" fossils.